Unleash your sacred healing business in 4 months by invoking the new angelic and energetic codes of abundance. Welcome Goddess, Are you ready to Light up the world as a highly skilled, successful healer and super clear intuitive channel? Now, more than ever, our world needs authentic, Divinely aligned, skillful healers willing to answer their calling and step into their power. In this 4-month Training Immersion, you will release all that has been holding you back from seeing and knowing your Divine worth. Under my guidance you'll learn powerful healing and alignment techniques, step into your intuitive Goddess power and discover the path to unleashing Divine success and abundance working with energy and angels. It's time to ascend, beautiful one! There has never been a better time to access your energy healing skills, activate your intuition and connect to Source. Heal yourself of doubt, struggle and fear and build your dream "light" business. You can manifest the life you desire and be fully and richly supported doing so. The time has long passed for gifted sensitives and natural healers to remain secretive, hidden, and struggling. You are who you are for a reason, the world needs you, but if you are stuck in struggle, lacking real direction, and repeating an endless cycle of fear and scarcity- then you're off track. You need real guidance, skills, strategy, and support to claim your true value and rid yourself of limitation, scarcity, and low self-worth. This Healing program is transformational, as you learn and practice the techniques and go through the guided attunements and releasing sessions, you make a shift which positively affects your entire life. I want to see you shine, to discover your innate Divine gifts, and to share them in a way that means you will soar into Divine Abundance and joy. You can also expect your finances, relationships, and health to improve too as your vibe naturally increases. It is all about energy and self-belief! Stop hiding who you are and accepting way less than you deserve Divine one: Discover how to work your light from the highest Divine frequency. Become an incredible healer that calls in your worth as you offer your services from a place of support, richness, and connection. Receive the highest level of knowledge, understanding, and experience with professional energy and angelic healing skills, and a consistent strong spiritual connection. Feel safe, supported and validated as an empathic, intuitive light-worker, as you release past traumas, internal anxieties, and ancient fears which have been draining your life force and pulling your energy down for eons. Completely detoxify your mind, body, and energy from past experiences, pain, and unconscious limiting beliefs. No longer feel overwhelmed or dragged down by the lower vibes of others learn how to own and hold your empathic love frequency and feel fully protected and strong in every aspect of who you are. Learn how to experience crystalline intuitive clarity and receive consistent accurate guidance for yourself and others. Let go of the idea that you have to hustle, suffer and compete to be a successful and prosperous healer-Raise your vibration and hold space for rich abundance as a Divine Goddess with authentic and effective skills that keep your clients coming back for more. Are you ready to claim your healing power, Divine connection and true purpose in life? I invite you to book in for a Free Divine Healer Consult call by clicking the button below. If you are like most empathic natural healers you have a strong desire to help and a heap of knowledge but you do not know how to convert this into success and abundance, if you did, you would have done it by now. Save yourself years of hard work and learn from someone who has walked the path and knows the way. Give yourself the knowledge, support, confidence, and energy you need to truly thrive. Protect your own energy and space with advanced methods for healers. In this program, I will hold sacred space for you, share the magical skills, intuitive knowledge and insights to become a highly intuitive healer and channel. I will give you support, inspiration, hands-on training, and the benifit of my knowledge and experience. I create a relaxed positive atmosphere to access the Divine codes of abundance and healing. This journey to become a healer involves so much more than learning and practice. You grow and heal yourself as you learn. This is a wonderful opportunity for you to lift your life to a new level and to release limitation and negative attachments, to truly step on your life path. Are a beginner with a dream or your already working as a healer but you are over the struggle and self doubt! You have had enough of trying to figure out how you are going to attract clients who rave about your services and keep coming back for more, You are tired of fear holding you down and you are ready to become a Wealthy Goddess of Healing! You need direction and action steps to move your dream to the higher levels. You want a Divine Teacher who has walked the path and knows the golden steps to create a highly successful wildly wealthy healing practice. I will find the magic and unique light within you and I will teach you, your worth! I know how to unleash your abundance and healing power. I want you to succeed and I will pass on all the wisdom, and what you need to know to give you confidence and help you to soar! Do away with those old feelings of self doubt and anxiety forever and BE DONE with feeling “not good enough /not ready” AND fully claim your inherent power as a Divine Energy Healer and Magical Light Worker manifesting an amazing life! Wave bye to struggle and lack, scrambling and hustling to make ends meet and worrying about where the money for next bill payment will come from to trusting in your connection with the Universe and fully poised to receive a flow of unlimited abundance and happy clients. Feel supported within a sacred space as you release trauma and other draining experiences and relationships which have been feeding on your life force and pulling your frequency down, so you can finally RISE and RECEIVE the higher vibrations of abundance, love, joy and flow you have been waiting for! Learn how to do your light work from the higher levels of Divine frequency where you give and heal from a place of Divine wholeness and nourishment NOT from suffering (those days are gone gone gone) It is time to Ascend! Make the vital important holy shift from feeling forever attacked, overwhelmed and dragged down by the judgments and low vibes of others into OWNING your beautiful empathic energy, feeling fully protected and standing strong in your Vibe. I attended this course from November 2017 through to February 2018. What a magical learning experience! I learned so much about myself and my interaction with the Universe. It changed my life in significant ways. My relationship with my loved ones improved but the most significant improvement was in my relationship with myself. 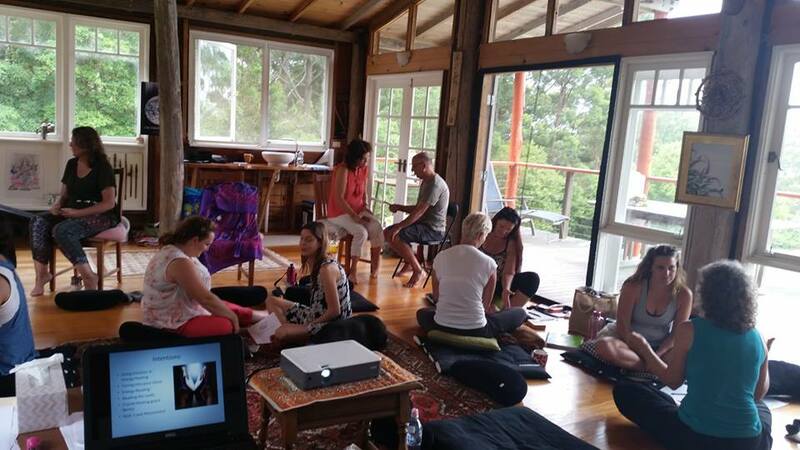 The course is presented in a clear, very understandable way with plenty of self-healing, insight and practical hands-on work to apply the learning as you go; this helped build my confidence immensely. The venue for the two-weekend seminars is so beautiful and perfect for the course. The webinars were insightful, easy to log into and the recording sent to you for revision. The Meditations were incredible both in person and on the webinars, you can really feel the energy even online. Rachel is a natural healer and her huge love, appreciation, and enthusiasm for what she does shines through in every session. The techniques are taught in a way that makes it so easy to apply in your everyday life. I really can't express enough gratitude and love for this course. I'm already applying all these methods and begun to give readings and healing sessions. I find synchronicity and interaction with the Angels every day now and I'm a different person; healthwise, financially and I've learned so much about the angels and energy. Thank you so much, Rachel, for your support and excellent teaching skills. If you are thinking of taking this course, whatever the reason; if you want to pursue a career in this field or just for yourself, I would highly recommend it! This is a comprehensive Certified Intuitive Angel & Energy Therapy Training Course with 2 powerful in person weekends. Transform from feeling blocked in healing work and intuition to giving proficient and highly effective healings and accurate consistent intuitive messages. Venue: Opal Cove Resort,Coffs Harbour, NSW. This venue is stunning and right on it's own private beach, close to a Coffs Harbour airport. Accommodation for participants is available at a special rate for attendees wishing to stay at their own expense. Morning tea and lunch provided on site. This group will meet twice throughout the year and each meeting will be held over two days. Sessions begin at 9am sharp and end at 4pm. Please arrive on time for all sessions. All prices are inclusive of GST and are per person. Your investment for group tuition is AU$2,500 less the AU$550 discount for payment in full before early bird expires. Your investment for group tuition is AU$2500 less the AU$300 earlybird discount. Total AU$2200 for 2 in person sessions. This option is available as a courtesy to assist financial planning and instalments do not relate to specific meetings therefore must be paid in full by the date specified. Attendance depends on payment. Your AU$400 deposit confirms your enrolment for this group. The remaining balance is payable in 5 instalments. The payment schedule is set out in an Invoice for Payment, and you agree to pay each instalment by its due date. The balance must be paid in full before the last meeting. Should a participant fall behind in the scheduled payments as agreed to in this contract, one or more of the following stipulations may apply: a) forfeiture of above-referenced discount; and/or b) dropped from the group with privileges for attendance of group sessions suspended until payments are brought current. Each instalment is $360, only if you pay a larger deposit you may discuss altering your individual payment amounts. Please contact Rachel Scoltock to arrange this. Once payment has been processed and the group is officially on, you agree to pay for the full programme irrespective of whether you choose not to attend a particular session. No refunds will apply if you cancel anytime during the year after the fees are processed. Special conditions may apply.